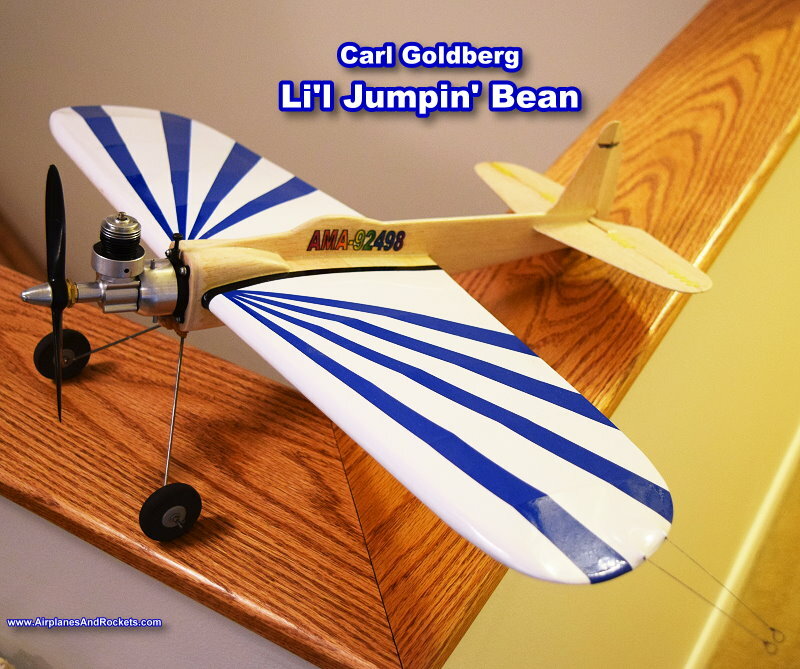 Philip with his first Carl Goldberg Li'l Jumpin' Bean, in our back yard in Smithsburg, Maryland c1991. 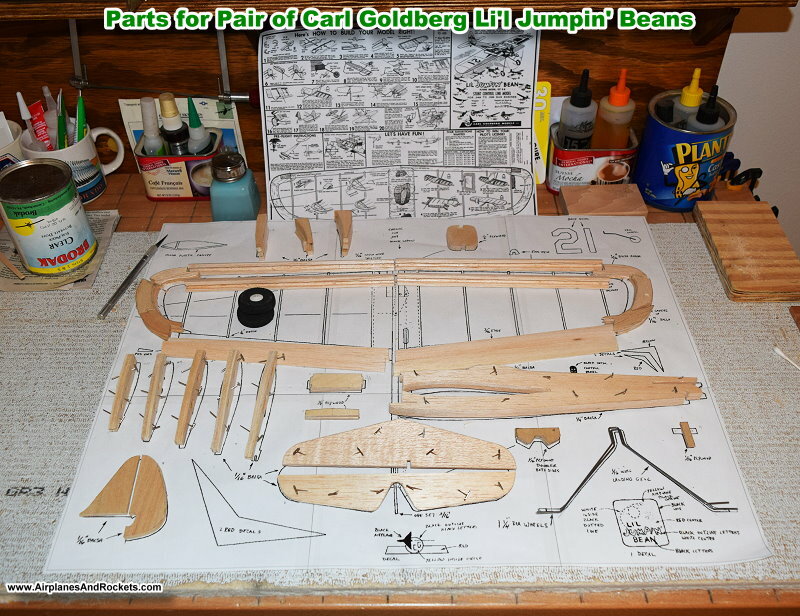 A pair of plans-built, framed-up Li'l Jumpin' Beans ready for finishing. 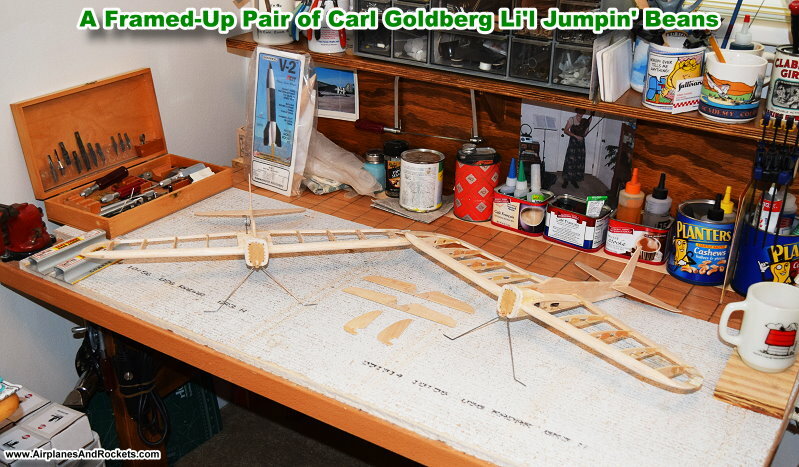 Parts were all cut and prepared for both models prior to assembly, so it was more like assembling prefabricated kits. 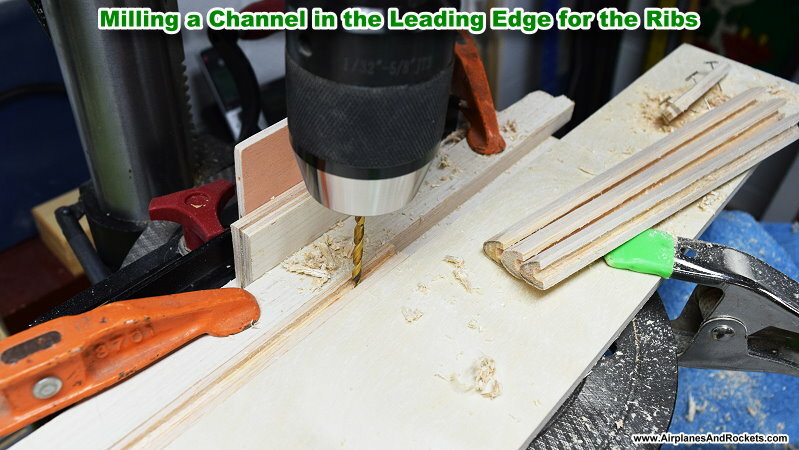 Milling a channel in the leading edges for the ribs. 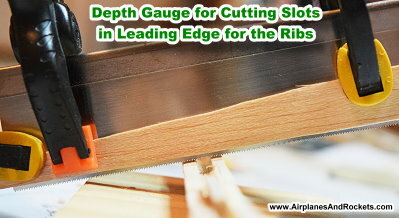 Depth gauge clamped onto razor saw when cutting rib slots in leading edge. 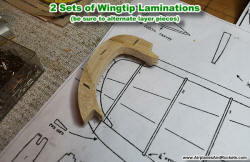 2 sets of wingtip balsa laminations. 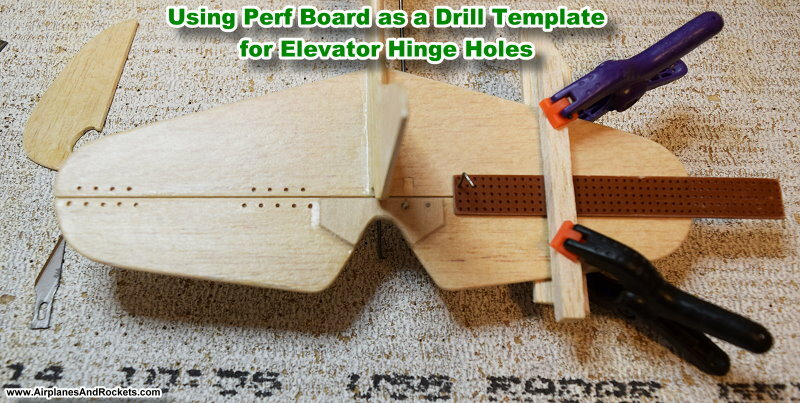 Using electronics perf board as a drilling template for the elevator hinge line. Letting out the lines for Li'l Jumpin' Bean #2. My son, Philip. 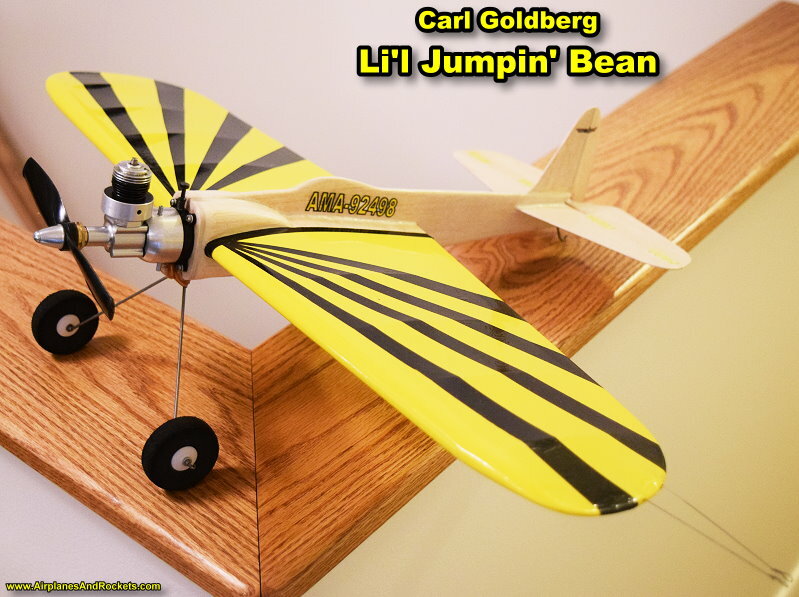 learned how to fly a control line airplane using the Carl Goldberg Li'l Jumpin' Bean. 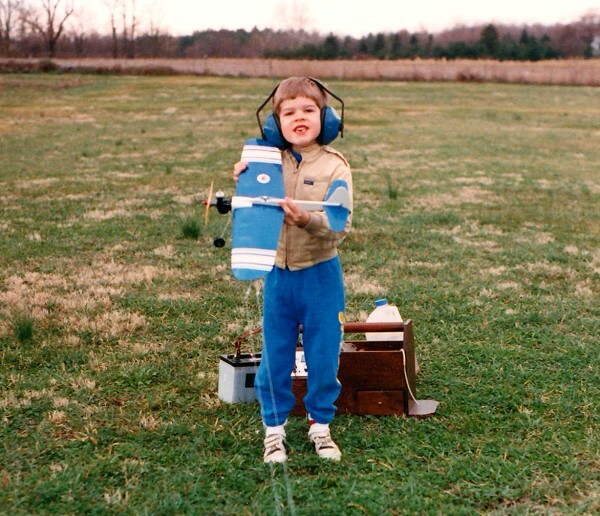 He is shown in the picture to the right in our backyard in Smithsburg, Maryland, sometime around 1991. 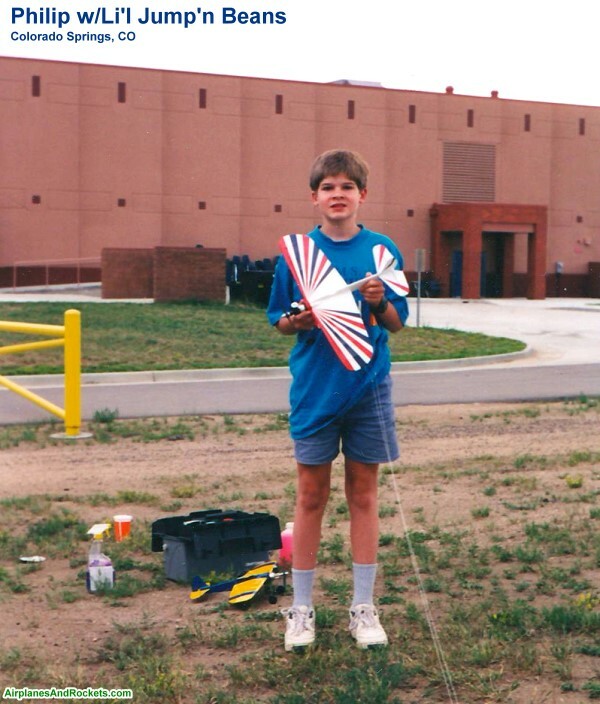 Philip was about 5 years old at the time. Note the use of ear protection. 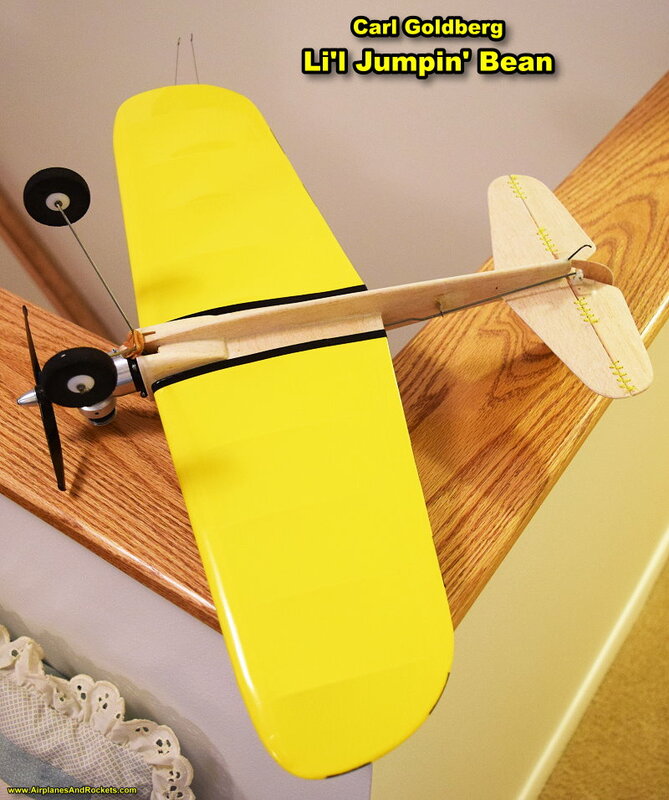 Having never been truly satisfied with the silence of electric-powered model airplanes, I made a decision to start reverting back to glow fuel models. 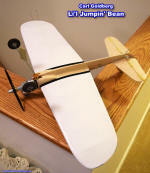 Yes, electric power is clean, easy to set up, and consistent motor runs are the rule, but I grew up with models I could hear flying as well as see flying. 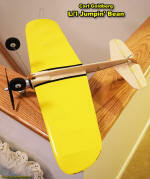 I've really missed the sound and smell of glow fuel engines after a 15-year hiatus. 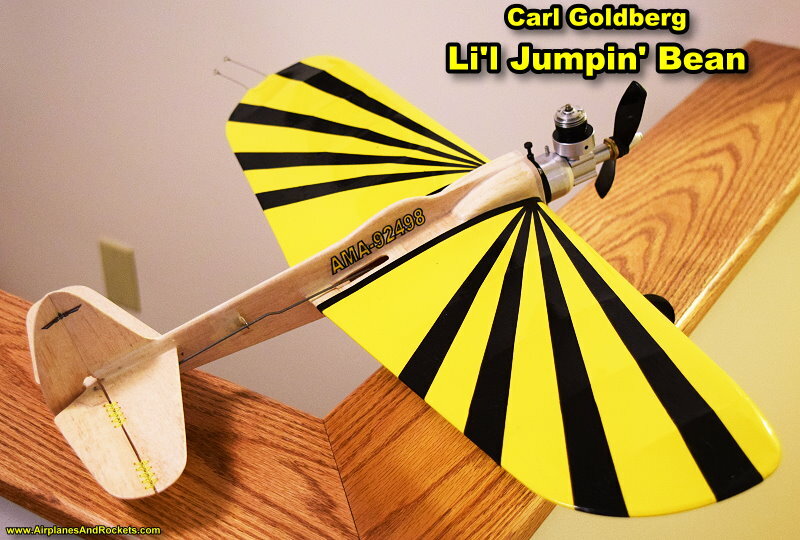 I'm starting with .049 engines mainly because of the high cost of fuel, but there's also a back-to-basics feel about them since I, like most kids in the 1960s and 70s, learned to fly with the plastic Cox models. 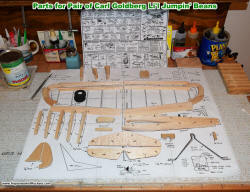 Carl Goldberg plans for the Li'l Jumpin' Bean did not include full-size outlines of the ribs, tail feathers, fuselage, etc., but fortunately some kind soul made a plan sheet with all the individual parts. It can be downloaded for free from the outerzone.co.uk website. 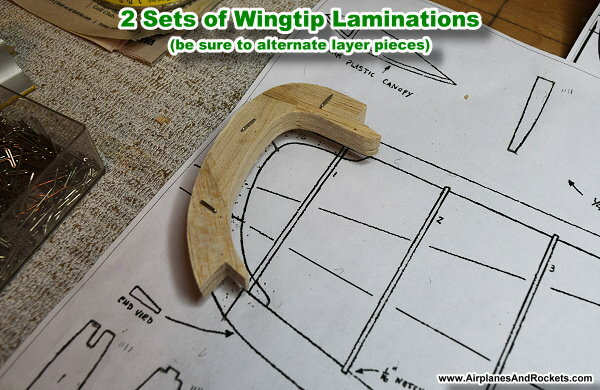 I used it to produce two complete 'kits' of parts. Wanting my Li'l Jumpin Beans to be as authentic as possible, I took the trouble to reproduce all the components faithfully. Yes, I know kits can be purchased from Brodak now), but my guess is the leading edge does not have the groove or notches for the ribs. 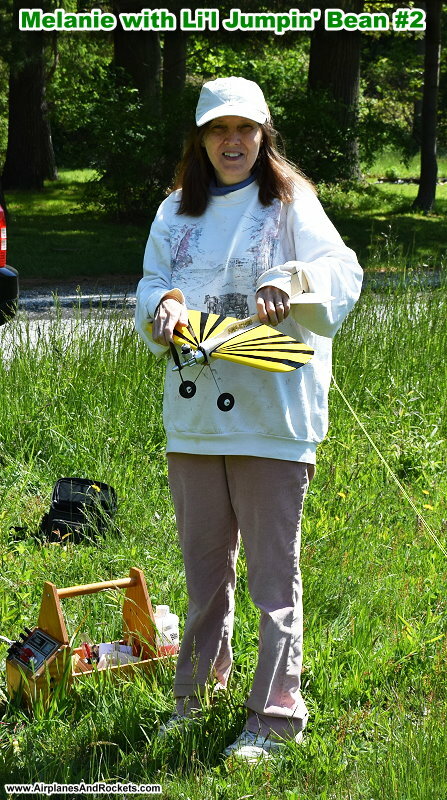 Also, the Brodak version has a cutout in the fuselage for their beam mounted .049 engine rather than the bulkhead mounted Cox engines. 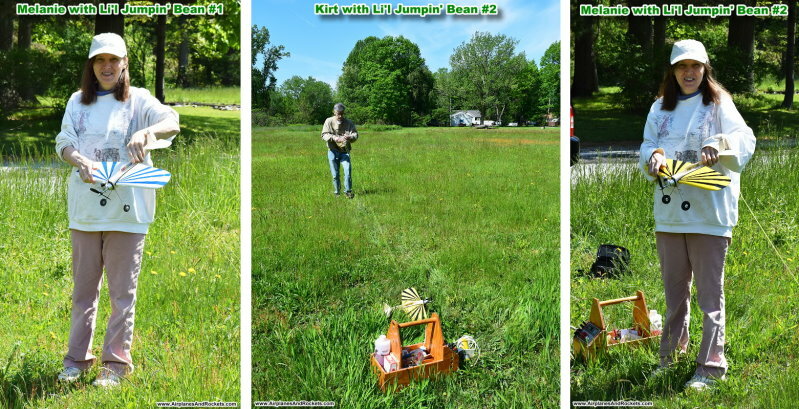 Melanie holding Li'l Jumpin' Bean #1 and #2. 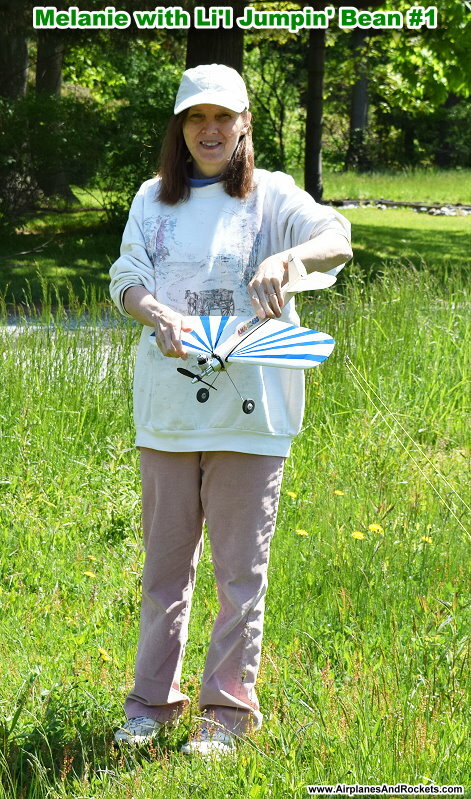 She has been my model airplane enabler for almost 35 years. As I recall, the learning process went quite well, with only a couple minor mishaps. 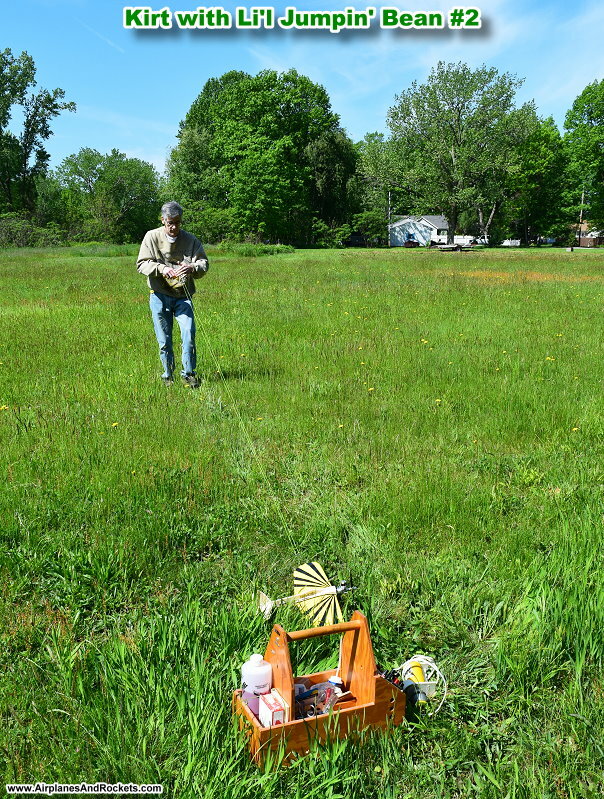 The propeller was installed backwards to provide less thrust, and the Cox Black Widow .049 engine was adjusted to run as slowly as possible while still being reliable. 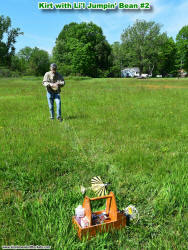 By this time, I had finally purchased an electric starter for small engines, so the process was much easier. 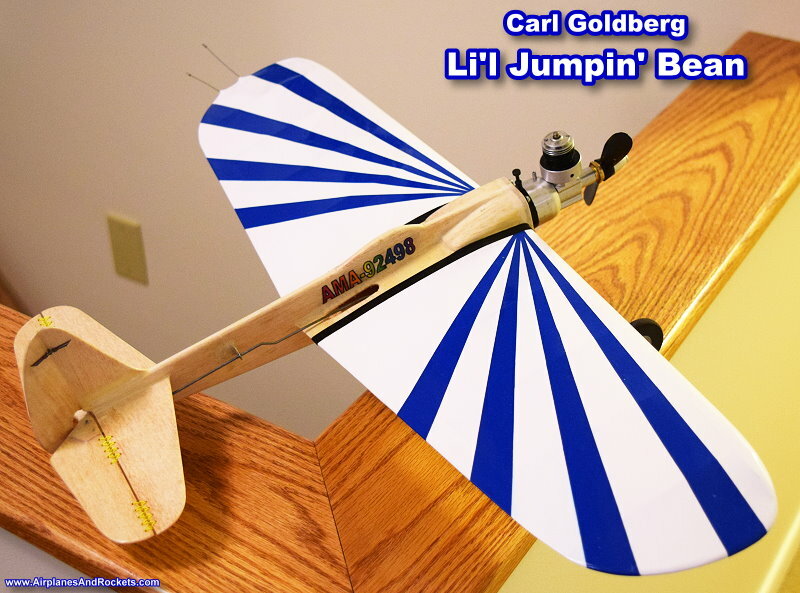 A few years later, we built two more Carl Goldberg Li'l Jumpin' Beans to use for dog fighting. That was in Colorado Springs sometime around 1998. I've got picture somewhere but cannot find them.